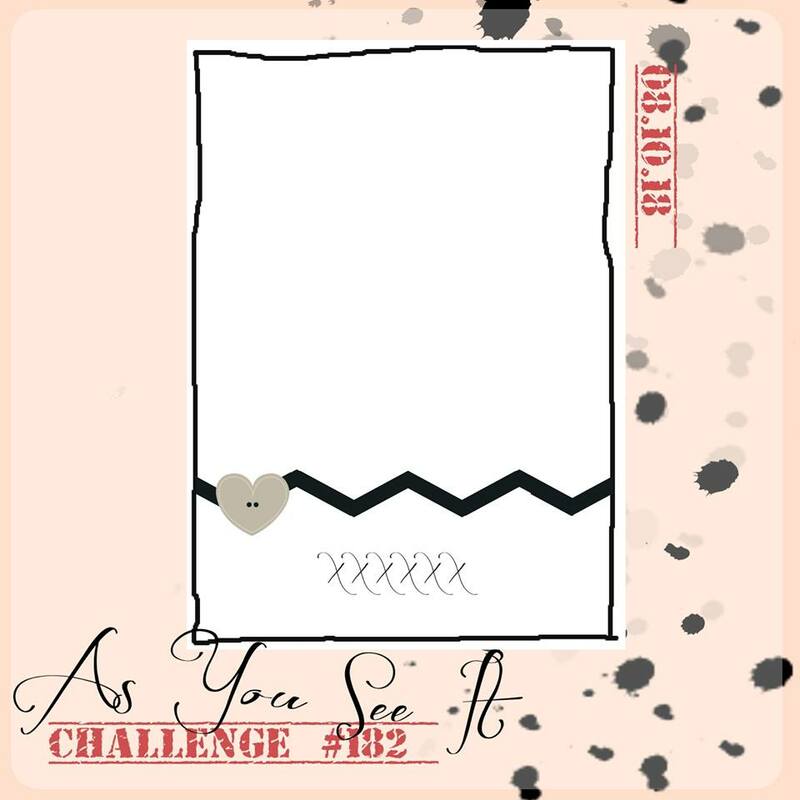 In trying to show you the versatility of the Blended Seasons Bundle that is available for a limited time to you, I decided to use this week's As You See It Challenge sketch to do a Christmas design using the Blended Seasons Christmas images and die cuts. 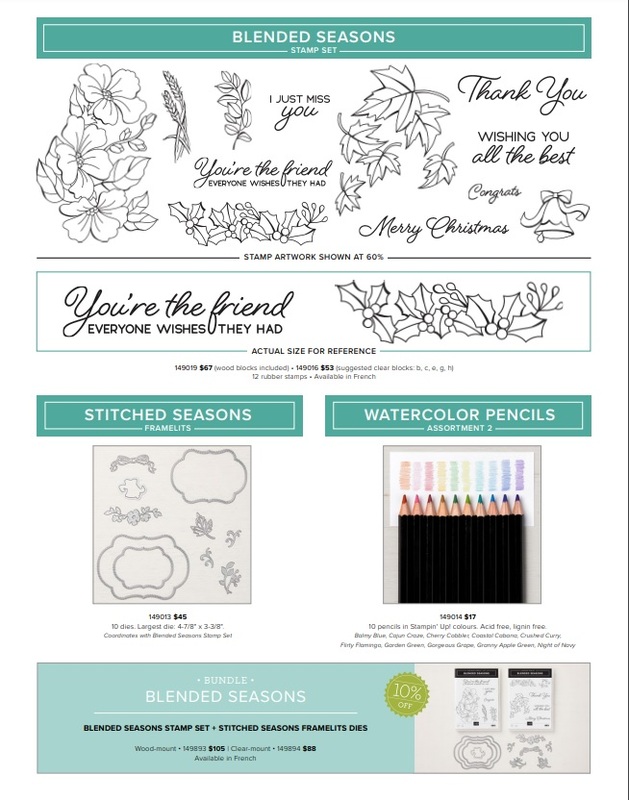 I used the largest label framelit from the Stitched Seasons Framelits that are part of this amazing bundle to divide my panel. Originally I was going to die cut the 4 x 5 1/4 panel of Under the Mistletoe DSP and flip the bottom part over to use the design on the reverse side, but it was too busy to be effective and I replaced the bottom part with an identical piece of Shaded Spruce cardstock. To make the die cut symmetrical on both sides, so that you can flip the bottom and it will still fit properly, on the back side I made a ruler mark at 2" across and positioned the middle point of the label die there when putting it through the Big Shot. I would recommend die cutting the DSP and the cardstock at the same time to make sure that you have them the same size. 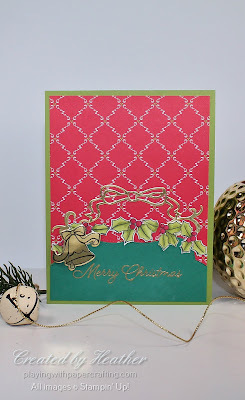 I stamped and coloured with Stampin' Blends, the holly leaves image from the Blended Seasons stamp set. 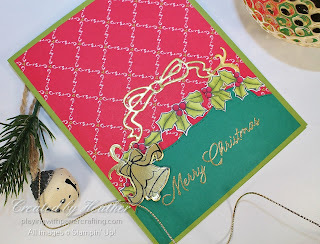 I used the Old Olive Combo and the Cherry Cobbler Combo Stampin' Blends for this job. I fussy cut the holly leaves minus some of the smaller foliage bits to arrange along the divide in the panel. 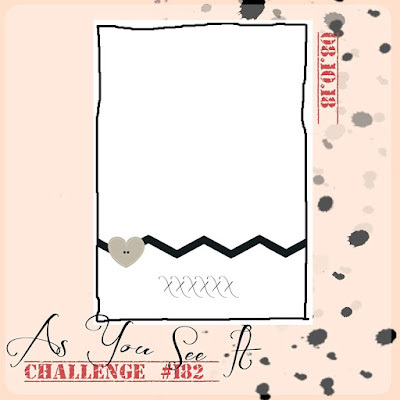 Using the Stitched Seasons Framelits, I die cut a couple of flourishes, a bow and I stamped and die cut the bell image to add to the card front. The sentiment is embossed in Gold Stampin' Emboss Powder. 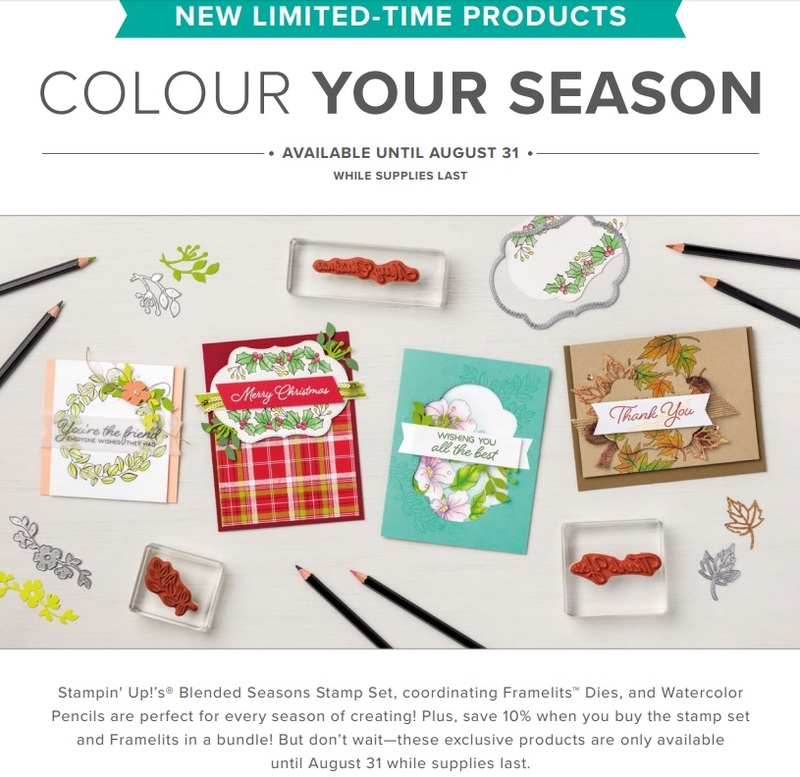 It is from the Blended Seasons stamp set as well. I really like the font. I hope I'm convincing you that this set is an important one to have in your craft stash even if it's only for the double stitched dies. You'll get a lot of use out of this one and you'll be earning Bonus Coupons to spend on the Holiday Catalogue in September!! Remember, this bundle is ONLY available WHILE SUPPLIES LAST during the month of August, then it's gone for good, so get your orders in quickly. I've created a Pinterest Page to show you the versatility of this set. You can access it here. And I hope you'll play along with us at As You See It Challenges this next week and a half.